31 TAKE THAT, JONESES! Most people don’t give much thought to garage doors, and we think that’s a pity. One of the least expensive ways to increase the value of a home is to upgrade the doors. Curb appeal is important, but it’s also just nice to come home to something beautiful. 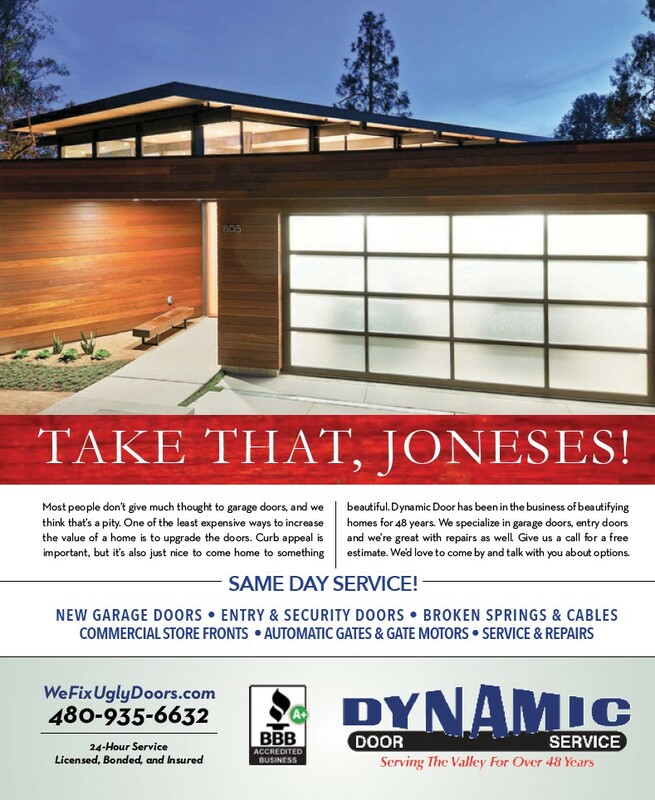 Dynamic Door has been in the business of beautifying homes for 48 years. We specialize in garage doors, entry doors and we’re great with repairs as well. Give us a call for a free estimate. We’d love to come by and talk with you about options. NEW GARAGE DOORS • ENTRY & SECURITY DOORS • BROKEN SPRINGS & CABLES COMMERCIAL STORE FRONTS • AUTOMATIC GATES & GATE MOTORS • SERVICE & REPAIRS WeFixUglyDoors.com 480-935-6632 24-Hour Service Licensed, Bonded, and Insured SAME DAY SERVICE!